Eduardo Falú was born in El Galpón, Salta (Argentina) on July 7, 1923. His parents Juan and Fada were immigrants from Syria, and his artistic path began in their family milieu. In Salta he met Jaime Dávalos, author of innumerable poems, some of which Falú set to music. He married Aída Nefer Fidélibus and they had two children. In 1945 he began his professional career in Buenos Aires with the poet César Perdiguero, lyricist for several of his compositions. In 1948 Falú was exposed to a larger audience thanks to radio. 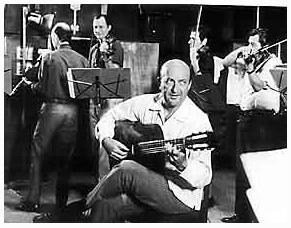 He produced his first LP in 1951, and in 1959 the LP “Falú in Paris.” In 1963 he traveled to Japan and gave 40 concerts. In 1964 he toured the US, and in 1968 Spain, France and England. Falú has composed more than 100 pieces, including “Las Golondrinas” (The Swallows), the zambas “La Candelaria” and “La Cuartelera,” and “Argentine Suite”. He has recently performed at the International Guitar Festival in Stockholm.